Idle SE 163 374, 3 miles N of Bradford. Transmission power is 50W for all 6 MUXES. Was originally an AV group for analogue, then it became, for reception of all digital a KV group, and will remain so until until Q1 2020 when, due to the 700MHz clearance, it will revert back to an AV. Most K group (or wideband) aerials will continue to work however. Click here for Idle`s radiation pattern. signal areas, the Yagi18K or XB10K for poor signal areas and the XB16K for those with the most marginal signals. The dimensions and test performance of the aerials can be found on the relevant tables. Ivybridge SX 631 538, 2m south of Ivybridge. All 6 MUXES transmitted at 50W. Was a BV 3 MUX transmitter but will be upgraded to a 6 MUX transmitter in Q2 2019, when it will become a KV group (B groups - and W/Bs - should still work however). For Ivybridge we recommend the DM log for strong signal areas, the Log 36 for medium signal areas, the Yagi18K or XB10K for poor signal areas and the XB16K for those with the most marginal signals. The dimensions and test performance of the aerials can be found on the relevant tables. Keelylang Hill HY 378 102, 5 miles W of Kirkwall (Orkney Isles). MUXES 1 to 3 are transmitted at 20kW and MUXES 4 to 6 at 10kW. Was a originally a BH group for analogue and still is a BH for all 6 digital MIXES (even after its 2017 700MHz clearance ). 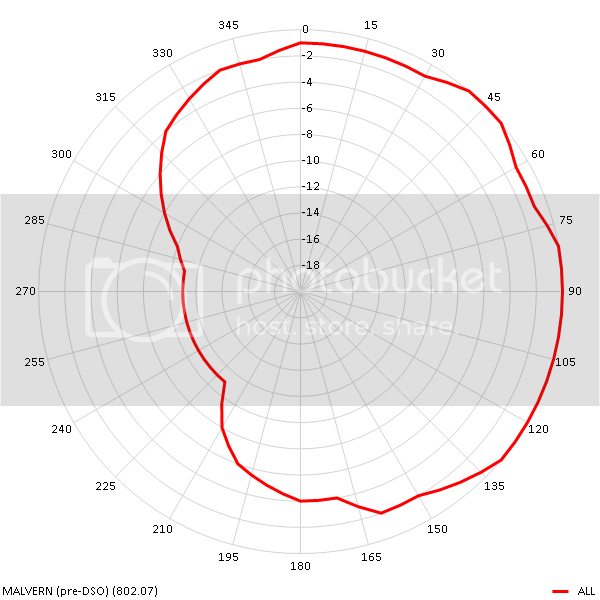 Click here for Keelylang Hill`s radiation pattern. For Keelylang we recommend the DM log for good signal areas, the Log 36 or Yagi18K for medium signal areas, the Yagi18B or XB10B for poor signal areas and the XB16B for those with the most marginal signals. The dimensions and test performance of the aerials can be found on the relevant tables. Keighley SE 069 444, 2 miles N of Keighley. Was a C/DV group for analogue and still is C/DV for all the digital until the 700MHz clearance (in Q1 2020) when it`s due to become a KV group (CHs 29 to 46). Most power is transmitted to the SW and little to the NE. For Keighley we recommend the DM log for good signal areas, the Log 36 or Yagi18K for medium signal areas, the DY14WB for poor signal areas. The dimensions and test performance of the aerials can be found on the relevant tables. Kilvey Hill SS 672 940, Eastern suburb of Swansea. All digital MUXES transmitted at 2kW. Was an AV group for analogue and still is an AV group for all the Digital and is due to remain so after the700MHz clearance in Q3 2019. For Kilvey Hill we recommend the DM log for strong signal areas, the Log36 or Yagi18K for medium signal areas, the Yagi18A or XB10A for poor signal areas and the XB16A for those with the most marginal signals. The dimensions and test performance of the aerials can be found on the relevant tables. See the wrong aerial for any A group transmitter. Knockmore NJ 321 497, 10 miles SSW of Elgin. Transmission power is 20kW for MUXES 1 to 3 and 10kW for MUXES 4 to 6. Was originally an AH group for analogue, then became a wideband at DSO, then, at Knockmore`s 700MHz clearance (in 2017), it has settled on a KH group (CHs 29 to 48). 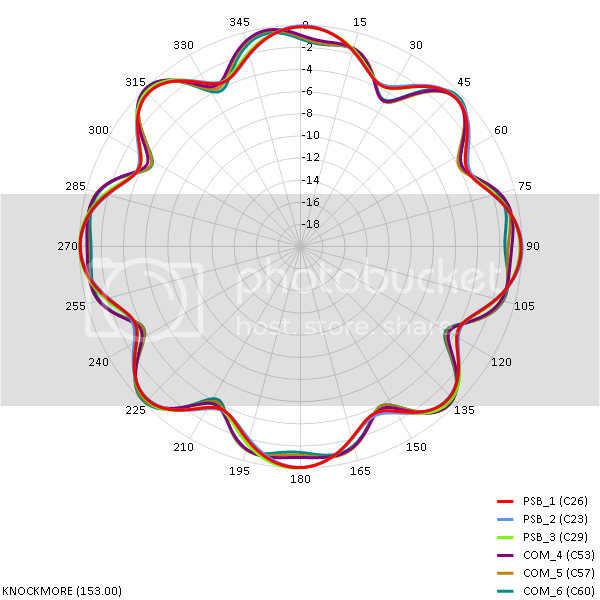 Click here for Knockmore`s radiation pattern. Lancaster SD 490 662, 3 miles N of Lancaster. All six digital MUXES are transmitted at 2kW. For Lancaster we recommend the DM log for strong signal areas, the Log36 or Yagi18K for medium signal areas, the Yagi18A or XB10A for poor signal areas and the XB16A for those with the most marginal signals. The dimensions and test performance of the aerials can be found on the relevant tables. See the wrong aerial for any A group transmitter. Lark Stoke SP 187 426, 8 miles S of Stratford U Avon. All six digital MUXES are transmitted at 1.3kW. Was an AV group for analogue then for all digital MUXES a KV group aerial is required, and nothing is due to change at the 700MHz clearance. Click here for Lark Stoke`s radiation pattern (pre DSO pattern but should still be similar). Note that The Wrekin, Bromsgrove and Lark Stoke are a Single Frequency Network. Limavady IC 711 296, 8 miles W of Coleraine (N Ireland). Was a C/DH group for analogue and still is a C/DH for all its digital output, but is due to become a BH (CHs 40 to 47) in Q3 2019 due to the 700MHz clearance. Most C/D aerials will continue to work however. For Limavady we recommend the DM log for good signal areas, the Log 36 or Yagi18K for medium signal areas, the Yagi 18E or the DY14WB for poor signal areas. The dimensions and test performance of the aerials can be found on the relevant tables. Llanddona SH 583 810, 6 miles N of Bangor. Was originally a C/DH group for the analogue then became an E group for digital, technically on the 14 Nov 2018 it became a B group (CHs 40 to 47) at the 700MHz clearance, but all E group aerials (and W/Bs) will continue working. In fact most old C/D groups should as well ! 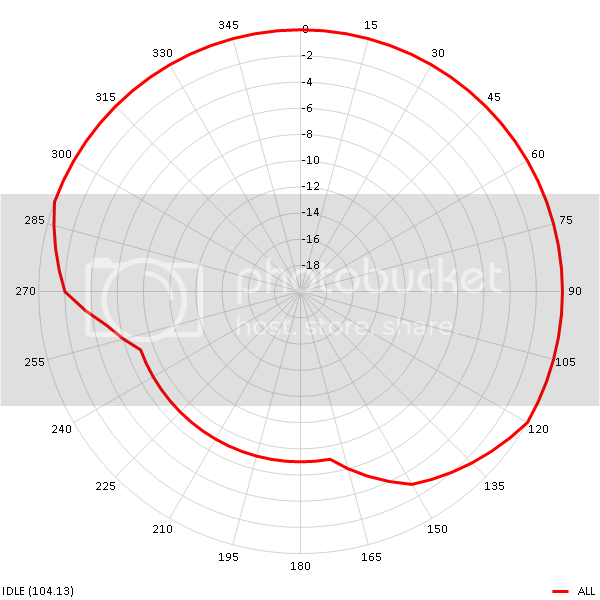 For Llanddona we recommend the DM log for signal areas areas, the Log 36 or Yagi18K for medium strong signal, the Yagi18B or XB10B for poor signal areas and the XB16B for the most marginal signal areas. The dimensions and test performance of the aerials can be found on the relevant tables. Malvern / Great Malvern SO 774 464, 8 m SSW of Worcester. Transmission power is 400W for all 6 MUXES. Was originally a C/DV group for analogue and digital, but became a KV (CHs 29 to41) in Mar 2018 due to the 700MHz clearance. Click here for Malvern`s radiation pattern (pre DSO pattern but should still be similar now). For Malvern we recommend the DM log for strong signal areas, the Log 36 for medium signal areas, the Yagi18K or XB10K for poor signal areas and the XB16K for those with the most marginal signals. The dimensions and test performance of the aerials can be found on the relevant tables. Margate TR 370 701, SE suburbs of Margate. All 6 MUXES will be transmitted at 200W. Was a BV 3 MUX transmitter but will be upgraded to a 6 MUX transmitter in Q4 2019, when it will become a KV group (B groups - and W/Bs - should still work however). For Margate we recommend the DM log for strong signal areas, the Log 36 for medium signal areas, the Yagi18K or XB10K for poor signal areas and the XB16K for those with the most marginal signals. The dimensions and test performance of the aerials can be found on the relevant tables. Note that Ashford, Margate & Dover are a Single Frequency Network. Mendip ST 564 488, 18 miles S of Bristol. All six MUXES are transmitted at 100kW. Was originally a C/DH group for analogue and still is C/DH for digital, though it will go KH (CHs 32 to 48) group (all excl MUX 7 & 8) between the 4 Apr and 19 Jun 2019 during the 700MHz clearance. For Mendip we recommend the DM log for good signal areas, the Log 36 or Yagi18K for medium signal areas, the DY14WB for poor signal areas. The dimensions and test performance of the aerials can be found on the relevant tables. See Mendip Graph. Midhurst SU 912 250, 20 miles NE of Portsmouth. For Midhurst we recommend the DM log for good signal areas, the Log 36 or Yagi18K for medium signal areas, the DY14WB for poor signal areas. The dimensions and test performance of the aerials can be found on the relevant tables. Moel-Y-Parc SJ 123 701, 15 miles WSW of Birkenhead. Power is 20kW for MUXES 1 to 3 and 10kW for MUXES 4 to 6. Was originally a BH group for analogue and it is still BH for all its digital output. Technically it will change to a KH (CHs 33 to 48) in Q1 2019 due to the 700MHz clearance but all decent B group aerials will continue to work fine (excl MUXES 7 & 8). signal areas, the Yagi18K or XB10K for poor signal areas and the XB16K for those with the most marginal signals. The dimensions and test performance of the aerials can be found on the relevant tables. See Moel Y Parc Graph. Nottingham SK 503 435, 5 miles E of Nottingham. Power is 400W for all 6 MUXES. Was originally an AV group but it became KV for digital which it will remain after the 700MHz clearance in Q1 2020.
signal areas, the Yagi18K or XB10K for poor signal areas and the XB16K for those with the most marginal signals. The dimensions and test performance of the aerials can be found on the relevant tables. See Nottingham Graph. Olivers Mount TA 408 869, Scarborough. MUXES 1 to 3 are transmitted at 2kW, and MUXES 4 to 6 at 1kW. Was a C/DV group and for analogue and also a C/DV for digital, though it will become an AV (CHs 29 to 37) in Q4 2019 at the 700MHz clearance. For Olivers Mount we recommend the DM log for good signal areas, the Log 36 for medium signal areas, the DY14WB for poor signal areas. The dimensions and test performance of the aerials can be found on the relevant tables. Oxford SP 567 105, 4 miles NE of Oxford. MUXES 1 to 3 are transmitted at 100kW, and MUXES 4 to 6 at 50kW. Was originally a C/DH group for analogue and also a C/DH for digital before it became a KH group (CHs 29 to 47) on 23 May 2018 due to the 700MHz clearance (excl MUXES 7 & 8). For Oxford (after May 18) we recommend the DM log for strong signal areas, the Log 36 or Yagi18K for medium signal areas, the Yagi18K or XB10K for poor signal areas and the XB16K for those with the most marginal signals. The dimensions and test performance of the aerials can be found on the relevant tables. See Oxford Graph. Pendle Forest SD 825 384, 3 miles NW of Burnley. All six digital MUXES transmitted at 100W. Was originally a AV group for analogue and also an AV for digital, no change due during the 700MHz clearance. 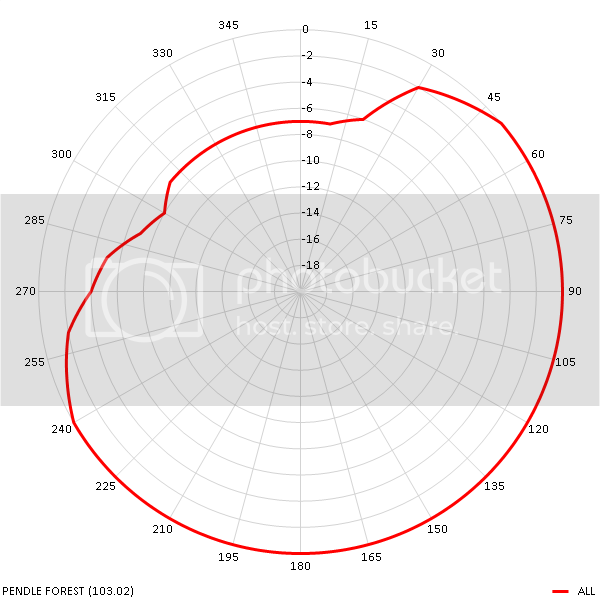 Click here for Pendle Forest`s radiation pattern. For Pendle we recommend the DM log for strong signal areas, the Log36 or Yagi18K for medium signal areas, the Yagi18A or XB10A for poor signal areas and the XB16A for those with the most marginal signals. The dimensions and test performance of the aerials can be found on the relevant tables. See the wrong aerial for any A group transmitter. Plympton SX 531 555, 2 miles ESE of Plymouth. All digital MUXES transmitted at 400W. Originally a C/DV group it became an EV for digital. Technically it`ll become a B group (CHs 40 to 47) in Q2 2019 during the 700MHz clearance, but E groups (plus W/Bs and most C/Ds ! ) will still work fine. For Plympton we recommend the DM log for signal areas areas, the Log 36 or Yagi18K for medium signal areas, the Yagi18E or the DY14WB for poor signal areas. The dimensions and test performance of the aerials can be found on the relevant tables. Pontop Pike NZ 148 526, 10 miles SW of Newcastle. For Pontop Pike we recommend the DM log for good signal areas, the Log 36 or Yagi18K for medium signal areas, the Yagi 18E or the DY14WB for poor signal areas. The dimensions and test performance of the aerials can be found on the relevant tables. See Pontop Pike Graph. Pontypool ST 284 990, 2 miles N of Cwbran. Was an AV group for analogue and still is AV for digital. No change in the 700MHz clearance. Click here for Pontypool`s radiation pattern. For Pontypool we recommend the DM log for strong signal areas, the Log36 or Yagi18K for medium signal areas, the Yagi18A or XB10A for poor signal areas and the XB16A for those with the most marginal signals. The dimensions and test performance of the aerials can be found on the relevant tables. See the wrong aerial for any A group transmitter. Presely SN 172 306, 10 miles S of Cardigan. Was a BH group for analogue and it`s still a BH for digital. No change in the 700MHz clearance. For Presely we recommend the DM log for good signal areas, the Log 36 or Yagi18K for medium signal areas, the Yagi18B or XB10B for poor signal areas and the XB16B for those with the most marginal signals. The dimensions and test performance of the aerials can be found on the relevant tables. Redruth SW 690 395, 1 mile SW of Redruth. Was originally a BH group for analogue and it is still BH for all its digital output. Technically it will change to a KH (CHs 32 to 48) in 1 May 2019 due to the 700MHz clearance but all decent B group aerials will continue to work fine. signal areas, the Yagi18K or XB10K for poor signal areas and the XB16K for those with the most marginal signals. The dimensions and test performance of the aerials can be found on the relevant tables..
Reigate TQ 257 521, Northern suburb of Reigate. Was originally an AV group for analogue, then became a wideband for digital. In March 18, due to the 700MHz clearance, it reverted to an AV. For Reigate we recommend the DM log for strong signal areas, the Log36 or Yagi18K for medium signal areas, the Yagi18A or XB10A for poor signal areas and the XB16A for those with the most marginal signals. The dimensions and test performance of the aerials can be found on the relevant tables. See the wrong aerial for any A group transmitter. Transmission power is 20kW for MUXES 1 to 3, and 10kW for MUXES 4 to 6. For Ridge Hill we recommend the DM log for strong signal areas, the Log36 or Yagi18K for medium signal areas, the Yagi18A or XB10A for poor signal areas and the XB16A for those with the most marginal signals. The dimensions and test performance of the aerials can be found on the relevant tables. See the wrong aerial for any A group transmitter. Rosemarkie NH 762 623, 12 miles NE of Inverness. Was a BH group for analogue and it still is a BH for all digital even after its 700MHz clearance in 2017. For Rosemarkie we recommend the DM log for good signal areas, the Log 36 or Yagi18K for medium signal areas, the Yagi18B or XB10B for poor signal areas and the XB16B for those with the most marginal signals. The dimensions and test performance of the aerials can be found on the relevant tables. Rosneath NS 258 811, 3 miles NW of Greenock. All 6 digital MUXES are transmitted at either 2kW vertical polarity or 8W horizontal polarity. Rosneath also transmits in horizontal (as well as vertical) polarity. It is one of very few TV transmitters to do this. Select whichever transmissions give you the best signal, though note that its vertical polarity signal has far greater power. 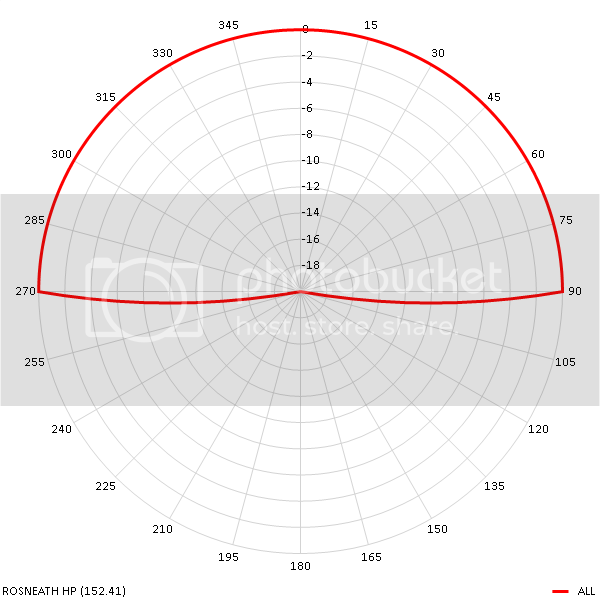 Click here for Rosneath`s (horizontal polarisation) radiation pattern. signal areas, the Yagi 18K or the DY14WB for poor signal areas. The dimensions and test performance of the aerials can be found on the relevant tables. Rouncefall TQ 866 931, 4m north of Southend. All 6 MUXES transmitted at 4kW. Was a BH 3 MUX transmitter but was upgraded to a 6 MUX transmitter KH group in Q3 2018, (B groups - and W/Bs - should still work however). For Rouncefall we recommend the DM log for strong signal areas, the Log 36 for medium signal areas, the Yagi18K or XB10K for poor signal areas and the XB16K for those with the most marginal signals. The dimensions and test performance of the aerials can be found on the relevant tables. Rouncefall is a single frequency network with Sudbury. Rowridge SZ 447 865, Isle of Wight. All 6 digital MUXES are transmitted at 200kW on vertical polarity. In addition MUXES 1 to 3 are transmitted at 200kW and MUXES 4 to 6 at 50kW on horizontal polarity. Was an AH group and still is AH for all the digital MUXES, and nothing is due change during the 700MHz clearance (either HP or VP) excl MUXES 7 & 8 (which moved in Mar & May 2018). Rowridge transmits in vertical (as well as horizontal) polarity. It is one of very few TV transmitters to do this. Select whichever transmissions give you the best signal. For Rowridge we recommend the DM log for strong signal areas, the Log36 or Yagi18K for medium signal areas, the Yagi18A or XB10A for poor signal areas and the XB16A for those with the most marginal signals. The dimensions and test performance of the aerials can be found on the relevant tables. See “The wrong aerial for A group transmitters” and Rowridge Graph. Rumster Forest ND 197 385, 13 miles SW of Wick. Was originally an AH group for analogue, then became a wideband as DSO, but, at its 700MHz clearance (in 2017), it reverted to an AH group ! Click here for Rumster Forest`s radiation pattern. Saddleworth SD 987 050, 8 miles ENE of Manchester. Was originally a BV group for analogue, still is BV for all its digital output and will remain so at its 700MHz clearance in until Q2 2020. 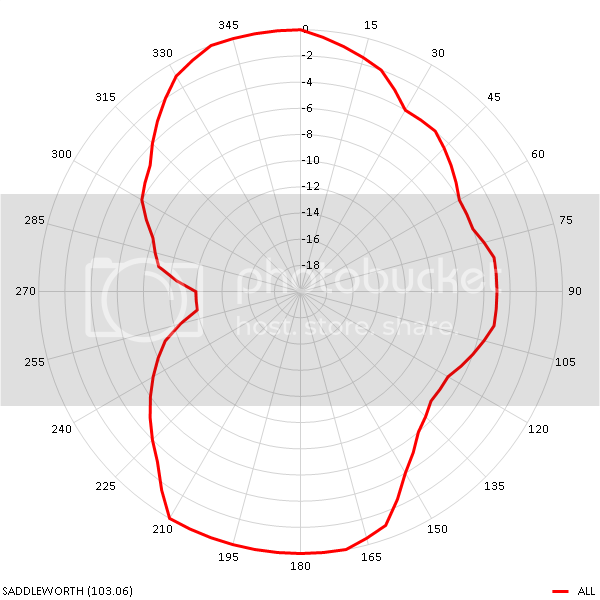 Click here for Saddleworth`s radiation pattern. For Saddleworth we recommend the DM log for good signal areas, the Log 36 or Yagi18K for medium signal areas, the Yagi18B or XB10B for poor signal areas and the XB16B for those with the most marginal signals. The dimensions and test performance of the aerials can be found on the relevant tables. Salisbury SU 136 285, SW suburb of Salisbury. All 6 MUXES are transmitted at 2kW. For Salisbury (after May 18) we recommend the DM log for strong signal areas, the Log 36 for medium signal areas, the Yagi18K or XB10K for poor signal areas and the XB16K for those with the most marginal signals. The dimensions and test performance of the aerials can be found on the relevant tables. Sandy Heath TL 204 494, 10 miles E of Bedford. Transmission power is 180kW for MUXES 1 to 3 and 170kW for MUXES 4 to 6. Was originally an AH group but became a KH group for digital, and will remain so after the 700MHz clearance in June 2018. For those in poor signal areas by Q1 2020 only MUX6 will be out of the A group (excl MUX 7 & 8). For Sandy we recommend the DM log for strong signal areas, the Log 36 for medium signal areas, the Yagi18K or XB10K for poor signal areas and, for those with the most marginal signals, the XB16K . The dimensions and test performance of the aerials can be found on the relevant tables. See Sandy`s graph. Seagry Court SU 149 881, northern suburbs of Swindon. All 6 MUXES transmitted at 200W. Was a BV 3 MUX transmitter but became a 6 MUX transmitter in March 2018, it stayed a BV. For Seagry Court we recommend the DM log for good signal areas, the Log 36 or Yagi18K for medium signal areas, the Yagi18B or XB10B for poor signal areas and the XB16B for those with the most marginal signals. The dimensions and test performance of the aerials can be found on the relevant tables. Selkirk NT 500 294, 36 miles SW of Berwick. Was a C/DH group for analogue and it was a C/D group for digital. However, the 700MHz clearance has complicated the issue, since 2017 it`s a wideband (MUX 1 moved down to CH32) but will end up a KH in Q3 2019 (though W/Bs and E groups will continue to work). Click here for Selkirk`s radiation pattern. For Selkirk we recommend the DM log for good signal areas, the Log 36 or Yagi18K for medium signal areas, the Yagi 18E or the DY14WB for poor signal areas. The dimensions and test performance of the aerials can be found on the relevant tables. All six digital MUXES are transmitted at 1kW. Crosspool was originally an AV group for analogue but for digital a K group is required. Nothing is due to change (except MUXES 7 & 8, which are due to be switched off) at the 700MHz clearance in Q1 2020 2019.
signal areas, the Yagi18K or XB10K for poor signal areas and the XB16K for those with the most marginal signals. The dimensions and test performance of the aerials can be found on the relevant tables. See Sheffield / Crosspool Graph. Stockland Hill ST 222 014, 8 miles S of Taunton. MUXES 1 to 3 are transmitted at 50kW and MUXES 4 to 6 at 25kW. 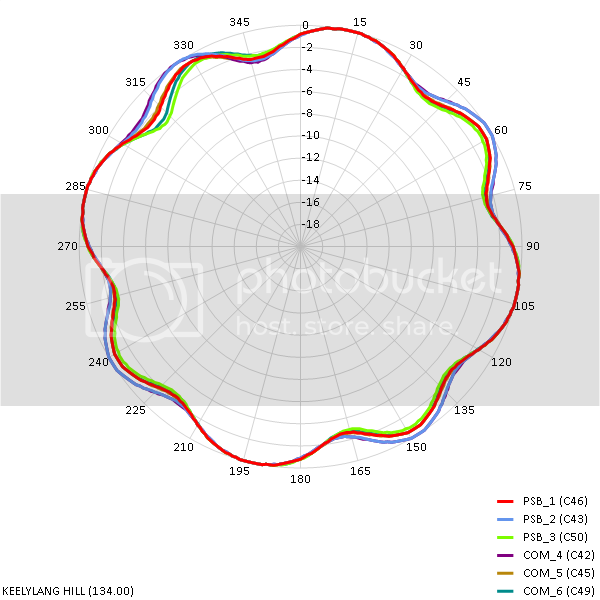 For Stockland Hill we recommend the DM log for strong signal areas, the Log36 or Yagi18K for medium signal areas, the Yagi18A or XB10A for poor signal areas and the XB16A for those with the most marginal signals. The dimensions and test performance of the aerials can be found on the relevant tables. See the wrong aerial for any A group transmitter. All 6 digital MUXES are transmitted at 560W. All Storeton`s output is attenuated from the South round to the West. For Storeton we recommend the DM log for strong signal areas, the Log36 or Yagi18K for medium signal areas, the Yagi18A or XB10A for poor signal areas and the XB16A for those with the most marginal signals. The dimensions and test performance of the aerials can be found on the relevant tables. See the wrong aerial for any A group transmitter. Storeton Wales began transmitting the three PSB MUXES (C/DH) in October 2009 but only from the South round to the West. This TX replaced the three relays at Flint, Bagillt and Holywell which ceased transmitting at switchover. Most people on Storeton Wales actually have their aerial on Winter Hill, so they also pick up these Welsh Language MUXES (from Storeton Wales) with that same antenna. As Winter Hill is changing from C/DH to KH (because of the 700MHz clearance) Storeton Wales will likewise change (in Q1 2019). Sudbury TL 913 377, 16 miles WSW of Ipswich. All 6 MUXES are transmitted at 100kW. Was a BH group for analogue then for digital it became an E group. During the 700MHz clearance on the 1st Aug 18 it changed to a K group (on CHs 29 to 47). For Sudbury we recommend the DM log for strong signal areas, the Log 36 for medium signal areas, the Yagi18K or XB10K for poor signal areas and, for those with the most marginal signals, the XB16K (or an XB16A, though MUX 6 won`t be receivable). The dimensions and test performance of the aerials can be found on the relevant tables. Sutton Coldfield SK 113 003, 8 miles NNE of Birmingham. All 6 MUXES are transmitted at 200kW. Was a BH group for analogue and it is still BH for all the digital channels. Nothing changed at the 700MHz clearance in Mar 18 (excl MUXES 7 & 8). For Sutton Coldfield we recommend the DM log for good signal areas, the Log 36 or Yagi18K for medium signal areas, the Yagi18B or XB10B for poor signal areas and the XB16B for those with the most marginal signals. The dimensions and test performance of the aerials can be found on the relevant tables. See Sutton Coldfield`s Graph. Tacolneston TM 131 958, 10 miles SW of Norwich. Was a C/DH group for analogue then went EH group for digital but it became a BH at the 700MHz clearance in June 2018 (excl MUX 7 & 8), though both C/D and E groups aerials should continue to work). For Tacolneston we recommend the DM log for good signal areas, the Log 36 or Yagi18K for medium signal areas, the Yagi18B or XB10B for poor signal areas and the XB16B for those with the most marginal signals. The dimensions and test performance of the aerials can be found on the relevant tables. The Wrekin SJ 628 082, 4 miles W of Telford. Was an AH group for analogue but (full) digital reception requires a KH group (or wideband) aerial. Nothing is due to change at the 700MHz clearance. For The Wrekin we recommend the DM log for strong signal areas, the Log 36 for medium signal areas, the Yagi18K or XB10K for poor signal areas and the XB16K for those with the most marginal signals. The dimensions and test performance of the aerials can be found on the relevant tables. See The Wrekin Graph. Torosay NM 703 358, Isle Of Mull 11 miles WNW of Oban. MUXES 1 to 3 are transmitted at 4kW and MUXES 4 to 6 at 2kW. Was an AV group for analogue and still is AV for digital even after its 700MHz clearance (Oct 17). For Torosay we recommend the DM log for strong signal areas, the Log36 or Yagi18K for medium signal areas, the Yagi18A or XB10A for poor signal areas and the XB16A for those with the most marginal signals. The dimensions and test performance of the aerials can be found on the relevant tables. See the wrong aerial for any A group transmitter. Tunbridge Wells TQ 607 440, 1m SE of T/Wells. Was a BV group for analogue and BV for digital, but, at the 700MHz clearance in July 2018, it became a KV (CHs 29 to 47). All decent B group aerials should continue to work fine however. For Tunbridge Wells we recommend the DM log for strong signal areas, the Log 36 for medium signal areas, the Yagi18K or XB10K for poor signal areas and the XB16K for those with the most marginal signals. The dimensions and test performance of the aerials can be found on the relevant tables. Waltham SK 809 233, 18 miles SE of Nottingham. signal areas, the DY14WB for poor signal areas. The dimensions and test performance of the aerials can be found on the relevant tables. See Waltham Graph. Wenvoe ST 110 742, 4 miles W of Cardiff. MUXES 1 to 3 are transmitted at 100kW and MUXES 4 to 6 at 50kW. Was originally a BH group and it still is BH for all the digital. No change at the 700MHz clearance, in 15 May 2019 (apart from MUX 7 & 8). For Wenvoe we recommend the DM log for good signal areas, the Log 36 or Yagi18K for medium signal areas, the Yagi18B or XB10B for poor signal areas and the XB16B for those with the most marginal signals. The dimensions and test performance of the aerials can be found on the relevant tables. Whitehawk Hill TQ 330 045, Eastern suburbs of Brighton. All 6 MUXES are transmitted at 4kW. Was a C/DV group for analogue and still is C/DV for all its digital output. But, at the 700MHz clearance in Q4 2019, it will become a KV (CHs 32 to 48). For Whitehawk Hill we recommend the DM log for good signal areas, the Log 36 or Yagi18K for medium signal areas, the Yagi 18E or the DY14WB for poor signal areas. The dimensions and test performance of the aerials can be found on the relevant tables. Winter Hill SD 660 144, 5 miles NW of Bolton. Was originally a C/DH group for analogue and stayed a C/DH for digital (excl MUXES 7 & 8). However, in Q1/Q2 2020, due to the 700MHz clearance, it will become an A group (CHs 29 to 37) ! 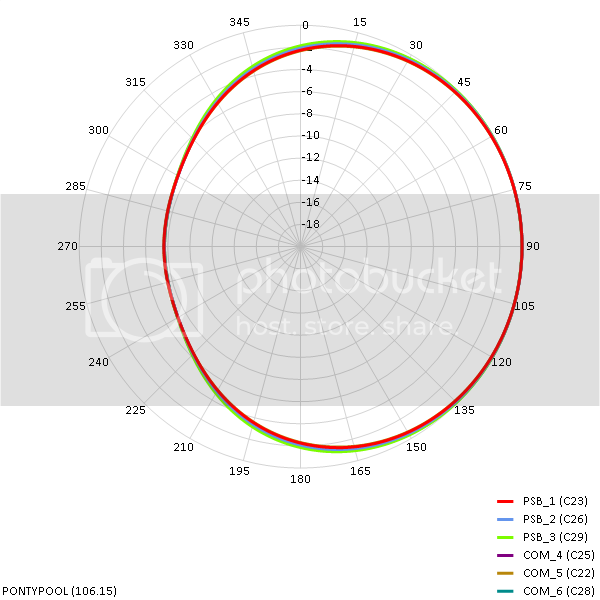 Most wideband aerials will continue to work, however, many older C/D aerials may struggle in poorer areas. 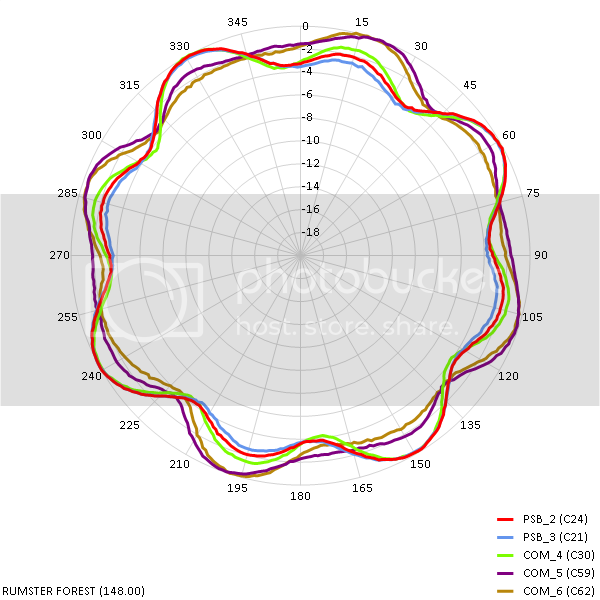 The good news is that those with poor signals who swap to an A group aerial will get significantly better reception even than with a wideband. For Winter Hill we recommend the DM log for good signal areas, the Log 36 or Yagi18K for medium signal areas, the DY14WB for poor signal areas. The dimensions and test performance of the aerials can be found on the relevant tables. See Winter Hill Graph. Wivenhoe Park TM 027 240, SE Colchester. All 6 MUXES transmitted at 20W. Was a CDV 3 MUX transmitter (CHs 49 to 57) but was be upgraded to a 6 MUX transmitter KV group in Q3 2018 (CHs 21 to 45). For Wivenhoe we recommend the DM log for strong signal areas, the Log 36 for medium signal areas, the Yagi18K for poor signal areas and the XB16K for those with the most marginal signals. The dimensions and test performance of the aerials can be found on the relevant tables. Worcester SO 868 558 Eastern centre of Worcester. All 6 MUXES are transmitted at 50W. Worcester is a new transmitter (March 18) and is AV group. For Worcester we recommend the DM log for strong signal areas, the Log36 or Yagi18K for medium signal areas, the Yagi18A or XB10A for poor signal areas and the XB16A for those with the most marginal signals. The dimensions and test performance of the aerials can be found on the relevant tables. Worcester is in a Single Frequency Network With Ridge Hill. Wroughton SU 159 826 South Swindon. Wroughton is a new transmitter (March 18) and is BH group. For Worcester we recommend the DM log for good signal areas, the Log 36 or Yagi18K for medium signal areas, the Yagi18B or XB10B for poor signal areas and the XB16B for those with the most marginal signals. The dimensions and test performance of the aerials can be found on the relevant tables. Wroughton is in a Single Frequency Network with Seagry Court.